Employ Graham Onions. If there's one thing I've learnt from this year's County Championship, it's that you should always try to employ Graham Onions. I'm not sure this applies to every industry, but I wouldn't bet against it. Seventeen first-class counties didn't employ Graham Onions this year and those very same 17 counties failed to win the County Championship. In simple terms, employment of Graham Onions provides the foundations on which everything else is built. No one took more wickets, no one who took more than 20 wickets did so at a lower average, and no one took more five-wicket hauls. Onions' only failing has been in his performances when pitted against the England tape measure. 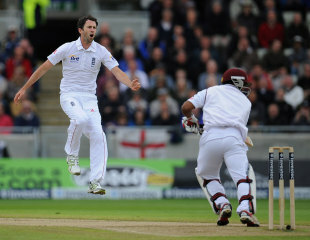 It seems he will never play another Test unless he learns to bowl in stilts. Height is the only possible reason why England do not want to employ Graham Onions. In fact, it seems safe to assume that centimetres have come to supersede wickets as a selection criterion to such an extent that the latter is no longer even a consideration. Sadly, as Will Jefferson has retired, we cannot properly test this theory. There is little Onions can do in this regard. It is hard to work on your height. Perhaps he could have taken the opportunity presented a couple of years ago by his back surgery and asked them to slot in a few extra vertebrae while they were at it, but that ship has sailed. All he can do now is dismiss every single batsman in domestic cricket without conceding a single run, in the vain hope that someone might notice and also care. One team who didn't have to sweat Onions this year were Surrey, because he missed both fixtures. Surrey provide an interesting contrast to Onions' team, Durham, in both methodology and results. Perhaps the most staggering achievement of the year was Surrey's successful relegation bid. The county achieved second-flight status despite making use of three of the finest batsmen of the modern era at various points during the season. Graeme Smith, Ricky Ponting and Hashim Amla all turned out for the county. Ponting managed to average 123 during his stay and yet Surrey still finished bottom of the first division with just one win. Interestingly, Durham did without an overseas player. It is hard to avoid the conclusion that the greater the ratio of Graham Onionses to overseas stars, the better your side will perform. A lesson for everyone there - albeit a lesson that is entirely irrelevant in our day-to-day lives. Then again, there is another interpretation that acknowledges the fact that teams feature more than one player. Perhaps Surrey's bowling is what let them down. Here the picture is very clear. No matter what the pitch, no matter what the conditions, no matter what the opposition, Jade Dernbach should never be your most successful bowler. Jade Dernbach was Surrey's most successful bowler. Comparisons don't get much more damning than that. Chris Tremlett has therefore earned an England call-up. Apparently he performed well when they did a vertebrae count.